Digital photo tree helps visitors get in the mood for a joyous children’s museum. Would you smile or cringe if you heard someone say that, while they were using something you had worked on for more than two years? 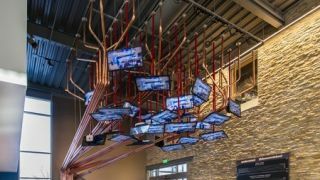 The exhibit Goldstein is describing is a 20’ tall, abstract copper and steel tree-like structure with 30 Planar LED-lit LCD displays forming the canopy. Each shows a picture of a family. It’s the first thing visitors see when they walk into the Museum, and the first thing most people do is walk up to a camera and monitor at the base, shoot a photo, then watch as it appears above them. There are props they can use –big red lips, mustaches and masks– because the point is to be as funny as you possibly can be, together as a family. “People love it,” Goldstein says. Close-ups of the Planar displays with the Mac minis mounted behind them. Photo by J Gramling Photography. The Community Tree is part of a major addition that more than doubled the size of the Museum when it opened last November. “We were the most crowded children’s museum in the country, if not the world, and we desperately needed to expand,” Goldstein explains. The expansion includes two new wings with a climbing tower, art studio, teaching kitchen, water and energy exhibits, plus a new entrance and a 30,000 square foot outdoor adventure park. The whole Museum is based on the idea of “sophisticated whimsy,” where children and adults learn through play. He said the exhibit didn’t start out as a tree, but when he showed his early drawings to colleagues, they kept returning to that metaphor, of families interconnected like branches and leaves. Once someone shoots a photo, it appears on one of the displays up in the canopy, then moves from display to display as new ones are shot. After it passes the 30th display, the image disappears. “To alleviate any privacy concerns, we promise our guests that we will not keep any of the images,” Goldstein says. To participate, visitors step up to a steel and walnut cabinet at the trunk of the tree, which includes a digital camera, a 31th Planar display that shows their image, a rack that holds the props, and the electronics that power the exhibit. When they push a big green button, a timer counts down with 3-2-1 showing on the display, and the picture is shot. A walnut bench gives parents a place to sit for the photo and something for smaller children to stand on so they appear in the frame. Thompson and his team at Logic designed and built a working, floor-based mockup and showed it to Goldstein, the Museum and potential donors. “They really liked it and decided to move forward.” The main challenges for Thompson were choosing highly-reliable components that would not need to be serviced up in the ceiling, and inventing a simple way to move the images from display to display. One of the nice features of the interface is that Museum staff have control over the images on the tree from a computer at the reception desk, using a standard web browser. If someone shoots an inappropriate photo, or a parent asks that an image be removed, they can remove it easily. “They can also load up special images or logos for a corporate event – really, anything they want, like a digital signage display,” Thompson adds. An important part of the exhibit’s success is that it’s fast. “Ten seconds is about right, to capture the image and beam it up to the first display,” Goldstein says. Nonetheless, Thompson adds that when he visits the Museum there’s always a line. The push button actually clicks a modified Apple mouse to start the countdown sequence. “That button, as simple as it is, actually confuses a few of our younger guests,” Goldstein says. It turns out that some three year olds expect a display to be a touch screen, and they will pound on the image trying to make something happen.